This is my daughter Ava. Ava is four and a half years old and has endless possibilities in front of her. She loves Wonder Woman, ballet, unicorns, Walt Disney World, making her own music, dancing, watching Star Wars and acting it out with BB8, building LEGO’s, racing HotWheels (cars), drawing, building forts, and baking. Every day I tell her that she can truly be anything she wants. I am not saying this because like most fathers, I believe my daughter has the right to do anything. I say this because she is growing up in a house where traditional gender stereotypes won’t hold her back from her future, in STEM or wherever it leads. There is no “girl stuff” and “boy stuff”; everything is “our stuff”. Ava is interested in things that her mom and her dad are interested in, and it’s up to us to ensure she learns that no one will be able to hold her back from her dreams, even as a princess-doctor-ballerina. As a father, I am acutely aware of the impact I have on my daughter. Negative self perception has plagued generations of girls from entering STEM fields. By the time a student reaches sixth grade, they have made a conscious decision whether they are good at math and science. For many girls, their own self perceptions in these areas are negative. A National Science Foundation project out of the University of Michigan has recently shown the significant impact dads have on girls and gender stereotypes. Fathers’ gender stereotypes are incredibly important in supporting (or in undermining) daughters’ choices to pursue math and science. The study found that girls’ interest in math decreases as their fathers’ gender stereotypes increase. This issue has not been lost on society though. Brad Meltzer wrote an amazing book highlighting amazing women in our culture as well as (more importantly in my mind) in his own life as well. The idea that role models and heroes in STEM, as well as in life, have to be larger than life personalities is dispelled by Brad as he highlights the ordinary people who do amazing things. This book inspired me to share with my own daughter the amazing women in our family and circle of friends. Mattel and Barbie have had many critics on their role in gender stereotyping over the years. However, over the past 5 years they have been actively trying to change those stereotypes through campaigns such as #DadsWhoPlayBarbie and #YouCanBeAnything. Helping dads see the impact of playing and interacting in the world of their daughters forms a tighter bond and research shows that girls who have loving, communicative, supportive relationships with their dads from early childhood on are less likely to suffer from a lack of self-confidence as she grows up. A lack of self-confidence has been a barrier and a critical need for young girls in developing an interest in STEM. Dads and daughters have always had a special bond. That bond shapes our daughters views on the world as well as how they see themselves fitting. 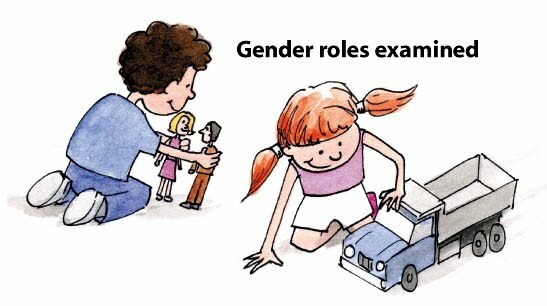 As fathers, we need to look at the subtle gender biases we impress on our young girls and boys. A 2016 study found that U.S. teenagers with supportive fathers have greater optimism and self-efficacy, which translates to better school achievement. The results occurred even for fathers with little education and limited English. Perception is the greatest impactor on shaping our children and how we connect with our daughters will shape their self perception for the future. Verizon showcased how our words impact our daughters self perceptions with their #InspireHerMind Campaign. My favorite line really has resonated with so many people, “Isn’t it time we told her she’s pretty brilliant, too?” Being supportive is the first step to preparing our children for their futures. Children who grow up being nurtured by both parental females and males are less likely to gender stereotype and have a more open self perception of what is possible. Girls who see that both men and women can be nurturers and typical household roles are shared and not “owned” by a man or a woman grow up to see possibilities instead of barriers. The same goes for empathy. Children with involved dads are more sensitive to people who are different than them. By being involved, children see how parents succeed and fail and wind up granting forgiveness for parents’ faults. They also see how men and women handle such situations differently. It has been proven and shared thousands of times, diversity strengthens society and companies. The more diverse a group that is solving a problem, then more effective the solution becomes. Preparing our children to work in these situations prepares them for a successful future. Try taking a quick Gender Role Quiz to reflect upon your own perceptions, your own upbringing, and your current house hold. All of these items and issues, from empathy to self assuredness, tie back to preparing our daughters for a future in STEM. Microsoft recently published a report called “Closing the STEM Gap” which showed that having an encouraging Dad who communicates about STEM is associated with girls being an average of +17 points more interested in all STEM subjects. Because many girls still think of STEM as skewing male, it helps to have men in their lives saying, ‘This is open to you, too.’ Dads also had the greatest impact on whether girls were interested in taking computer science, technology, and engineering classes in school. According to a 2015 Girl Scouts report, 68% of teen girls interested in STEM say their dads play a key part in encouraging them. Dads are only part of the solution though. There are so many “specialized” groups supporting STEM, empowering young learners of all races, ethnicities, genders, and backgrounds. We need to remember that it takes a village though. Dads may increase girls interest in STEM by 17%, however when dads and moms support girls in STEM together, we see a 27% increase. When parents partner with teachers in supporting STEM for girls, it becomes a 32% increase. Adam Savage stated it best: “Fail isn’t the same failure, it’s iteration and progress”. This is not a “one or the other” situation; our daughters don’t have to just focus on math and engineering – they can do robotics AND ballet! Let your daughter build her own robot or design her own soapbox derby car – and if she wants to pause to put lipstick on or make sure her hair is perfect – why not? Just Remember, the first and most important role model your daughter will have is you. Jonathan Gerlach is an Albert Einstein Distinguished Educator Fellow Emeritus and NASA STEM Endeavor Fellow. He has a deep background in STEM, including a certification from Columbia University Teacher’s College in STEM Education with a distinction in STEM Education Leadership. He is currently a Senior Director of Customer Success on the Global STEM partnerships team at EVERFI. EVERFI empowers teachers to bring critical skills education into their classrooms at no cost. Bring these critical skills resources to your district today!